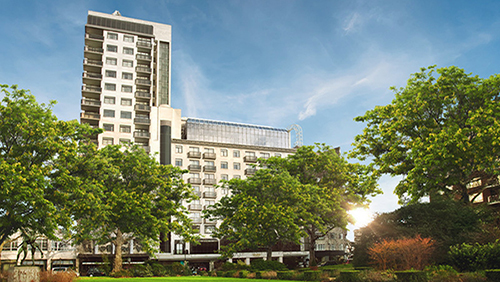 A Knightsbridge establishment for over 50 years, Jumeirah Carlton Tower is a renowned five star hotel in central London. Located on Sloane Street opposite the private Cadogan Place Gardens, this luxury hotel near Hyde Park is one of the best hotels in London. The hotel features 216 guest rooms of which 58 are suites, including the luxurious Royal Suite, offering superb views across London and interior design by Khuan Chew, the creative talent behind the interiors of the legendary Burj Al Arab Jumeirah, and spacious Executive Suites with their separate lounge and dining area, ideal for business travellers. Home to The Peak Health Club & Spa, guests can enjoy a relaxing spa treatment, invigorating workout in the state-of-the-art gym or swim in the 20 metre organic indoor pool. Combined with the hotel’s restaurants and elegant bars, Jumeirah Carlton Tower is the ideal destination. Hyde Park, the museums of South Kensington, including the Victoria and Albert Museum, and the city’s finest luxury shopping are all within easy walking distance of Jumeirah Carlton Tower. The luxury boutiques of Sloane Street and the world-famous Harrods and Harvey Nichols department stores are right on the hotel’s doorstep.